One Hawthorne is a 165-unit building developed by Jackson Pacific and MacFarlane Partners. 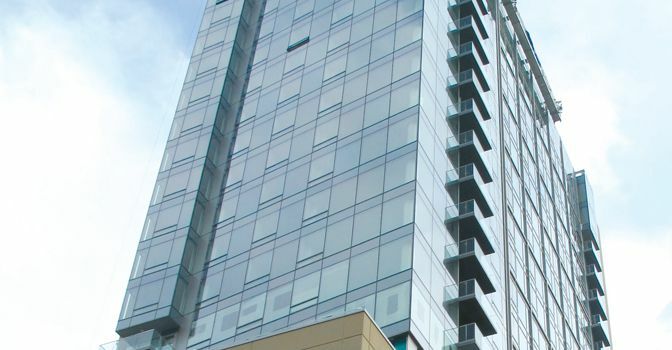 A boutique luxury condominium residence located in the Yerba Buena District, San Francisco’s cultural and business hub. This new residence with its central location is a "Walker's Paradise" for walkability and convenience to abundant shopping, world-class dining, cultural events, and nightlife. The new 25-story building represents smart sophisticated living at its best, and is a rare new residential opportunity in a dynamic and established neighborhood. One Hawthorne offers an intimate collection of homes with desirable amenities that include an attended lobby, valet parking, gourmet kitchens including Bosch and Thermador appliances, resident-only fitness center with outdoor terrace and a spectacular private 26th floor roof terrace that includes kitchenette, dining and lounging areas. The building’s design reflects balanced, well-crafted floor plans and elegant finishes.